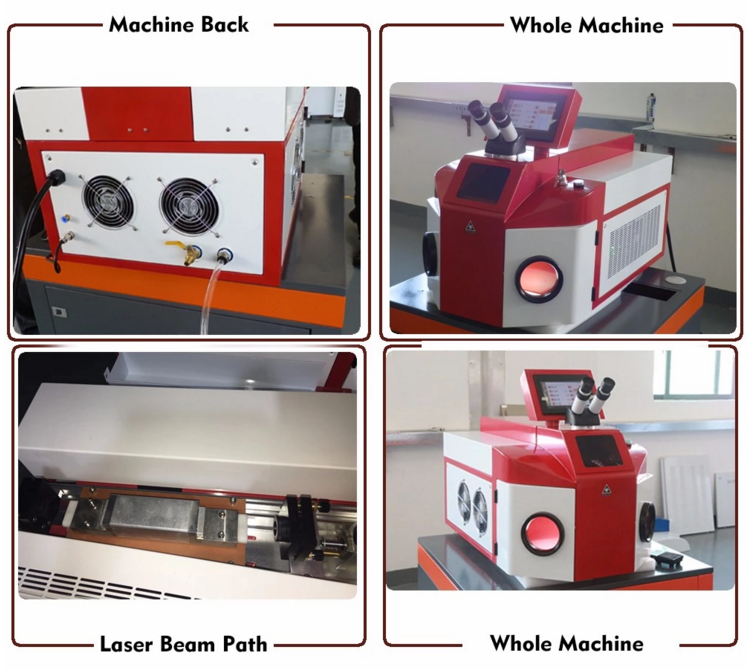 The laser spot welding machine200w dedicated to gold and silver jewelry, golf, fill holes for electronic components, welding trachoma, weld inlay mouth and so on. Welding firm, beautiful, non-distortion, simple operation, easy to use. 1.Whole machine adopted ergonomics design. It can better meet jewelry industry’s requirements on precision, beautiful, stable performance, long time and constant processing. 2.Big inner space, it is convenient for placing tools and fixtures. 3.It is equipped with electric focusing mechanism, digital scale reading display, regulating switch for laser parameters, it operates more smoothly. 4.It is easy to replace dust screen, clean working area and recycle welding slag. 5.With the LED ring-shaped astral lamp which can be highlighted and microscope imported from Germany, the observation on welding position is much clearer. 6.More precise light spot, it meets the requirement of precision welding. Commonly used in gold and silver jewelry, golf heads, fill holes, Chlamydia trachomatis in spot welding, welding of electronic components inlaid ornament, stainless steel, titanium alloys, welding, repair of precision casting products, widely used in jewelry, electronics, watches, and other industries. Spot welding, perforating, repairing, retipping and resizing of gold/silver/titanium/platinum jewelry and small accessories. Also widely used in aviation, aerospace, sports products, medical instrument, titanium alloy denture, instrument, electronics, machinery, automobile, etc. Widely applicable to all kinds of micro parts of precision welding, such as: Jewelry, electronics, watches, military.